So far, this December has been full of great events; from Christingle to the fund raising that has taken place for our Cash for Khazi project. The Christingle Service was delightful, with Jo Currie giving a lively talk about the meaning of Christingle. We managed to assemble the ‘worlds’, not eating the sweets until allowed! The candlelit singing was lovely and a wonderful start to Christmas. The Bondleigh Band gig on the 2nd December went with a swing. It was well attended, helping to raise the coffers for our loo. The following evening the fund raising quiz at The Tors was another great success. Eddy and Kay did a splendid job of organising. Many thanks to everyone who contributed to these events and to the villagers who supported them. In 2016, Steve had the idea of having giant puppets to represent the three wise men. So, we managed to obtain giant heads from Sticklepath Firework Show Committee who had made and used them in one of their shows. Consequently, our Epiphany Service last year had three brave men from Belstone wearing the huge Papier-Mache heads following a younger volunteer, carrying a giant star. They progressed through the village to the accompaniment of music form Bondleigh Band. A definite first for Belstone! 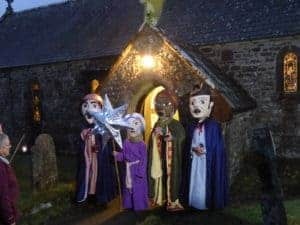 This year, on January 7th our Epiphany Service will start with refreshments at the Village Hall before we are joined by our giant Wise Men to make a procession, again accompanied by music from some of the Bondleigh Band, to a Service in the Church. The hall will be open for tea from 4pm. Everyone is welcome to join us and then make the procession with the wise men to Belstone Church at approximately 4.30pm. A sprinkle of Christmas magic came to St Mary’s at the annual Carol Service on Sunday 10th December. A full church, candlelight and sweet singing from the Year 1 and 2 choir from South Tawton Primary school, under the direction of Miss Andrews, gave a lovely atmosphere for all to enjoy. Mulled wine and mince pies in the village hall after the service were served by the loyal band of volunteers. Thanks are extended to all who helped in any way. The church cleaning group (which included de-composting the guttering! ), setting up the Nativity, adorning the windows with fresh arrangements (with lots of kindly donated holly), the readers, the waiting and washing up teams, the raffle ticket sellers. The list goes on …. Thank you all. During January and February the 11am Morning Prayer service will not be held. The 8.30am Holy Communion service will be held on the 4th Sunday of each month as usual. This is a simple said service, taken from the Book of Common Prayer and led by Steve Cook. It means an early start on a cold wintry morning but you can be assured of a warm welcome. Finally, we said farewell to our good friend Bob Hicks who has moved to Somerset with his wife Christine. Bob led our monthly Morning Prayer service for the past few years. His commitment to St Mary’s and to the community in Sticklepath has been truly blessed. We shall miss him very much and we wish them both well for the future.